Whether your picking operation is new, ever changing or just needs some TLC, Mallard has you covered. 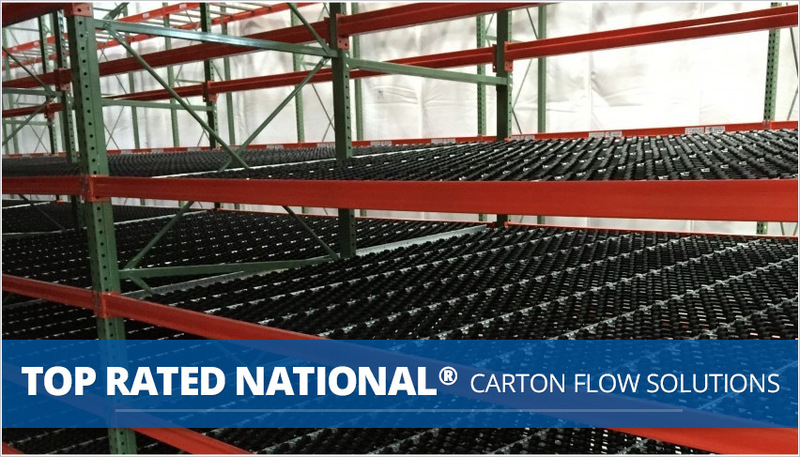 We have three unique carton flow rack options specially designed to accommodate varying cartons, totes and each-pick inventory while keeping SKUs organized and at the ready for picking. Durable, full-wheel bed solution, the perfect option for multiple, changing SKUs. Dyna-Flo carton flow is easy to assemble and reprofile with fully adjustable 12"-16" tracks that drop directly into new or existing pallet rack. Perfect replacement system for damaged carton flow. Heavy, abuse-resistant low profile tracks drop easily into existing carton flow shelves to form a solid wheel bed solution for varying sized cartons and totes. Rack-Trak wheeled tracks drop onto step-beams for quick, easy pallet rack conversions. Self-tracking lane assemblies are available in custom spacing configurations to meet all application requirements. The HD stands for heavy-duty – Mallard’s strongest, most durable carton flow. Dyna-Flo HD’s full-width wheel bed accommodates multiple carton sizes on each shelf level for flexible and easy product slotting. Mallard’s varying width carton flow systems make accommodating a wide range of cartons and frequent SKU and packaging changes easier and less disruptive to your picking operation. 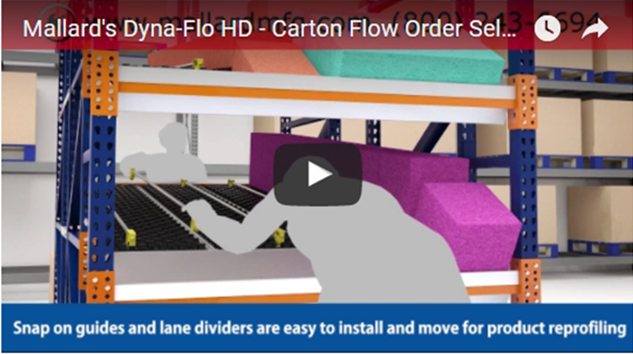 For a closer look at the ease and flexibility of our Dyna-Flo carton flow racking, check out our short video animation – Dyna-Flo HD in action with a variety of carton shapes and a product mix change-up in there too. All Mallard carton flow products are manufactured to the highest standards to meet the demands of the busiest warehouse environments. Our gravity flow experts are available to guide you in the selection of the best carton flow application for your unique product storage and fulfillment challenges.